The Russian MMA fighter who leaped into the octagon and struck Conor McGregor from behind following his defeat to Khabib Nurmagomedov has broken his silence. After submitting the Dubliner, Khabib jumped into the crowd to confront Dillon Danis, McGregor’s ju-jitsu partner. McGregor had an altercation with the Russian's cornerman as he tried to get out of the cage but was prevented from doing so by security. 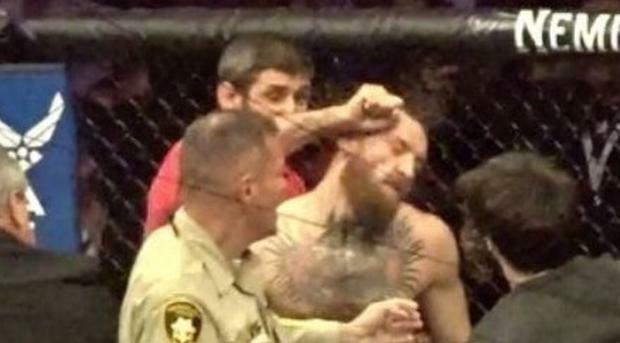 As he stood in the octagon a man wearing a red shirt leapt over the octagon and punched McGregor from behind several times. That man was Zubaira Tukhugov, a Russian mixed martial artist of Chechen descent who formerly fought in the Featherweight division of the UFC. He was due to fight McGregor's teammate Artem Lobov later this month but that fight is unlikely to go ahead after his antics in Las Vegas on Saturday night. Tukhugov has posted a video online in which he brags about the attack on McGregor. "I slapped him as promised,” the Russian is quoted as saying by the Mirror. “I promised to make him answer for his words and I did. "Everyone who thinks I missed, show me where,” he added on the video. "There is nothing. Just cop pushed me back on the video, as if I missed. Not even close. "Everyone who thinks I missed, I swear, nothing was too close."